Many Native American tribes of the Great Plains, notably the Pawnee, Shoshone, Arikara, and Wichita, had complex beliefs which included the use of a Star Chart & Astrology. Tribes such as the Cherokee believed that everything in the world is an earth reflection of the stars. The Pawnee believed that stars were deities who once lived on Earth and then were transformed into stars at death. Comets, meteorite showers and novas were viewed as omens of great disasters. The pictures depict a Pawnee Star Chart with clearly recognizable constellation patterns, as shown in the picture below. 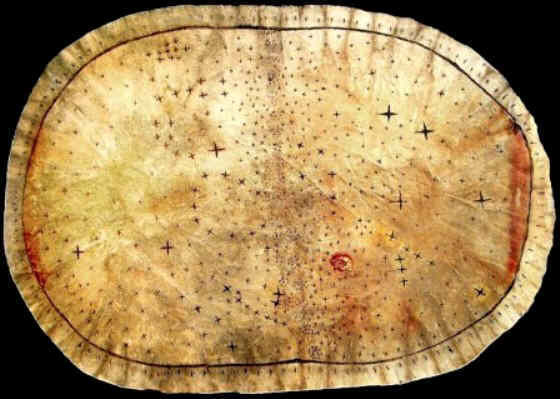 Instead of measuring the location of stars in order to calculate a location the Native Americans used the location of stars and constellations in the Star Chart & Astrology maps to signal seasons and events of the year.